My new favorite Swiss chard – peppermint. So pretty! Love the stripes! I stir-fried the Swiss chard stems (saving the leaves for other purpose) with sugar snap peas in a bit of garlic, ginger & scallion infused oil (see NOTE), salt & pepper to taste. Tossed in the tomatoes to heat through just before plating. Wanted to add some chopped roasted macadamia nuts but could not find them (still without a finished kitchen and needed items are a challenge to find among the boxes littering my dining room and family room). NOTE: Garlic, Ginger & Scallion Infused Oil – Add 1 – 2 cloves of smashed garlic, 1 – 2 slices fresh ginger and 1 smashed scallion (green & white parts) to 1 – 2 tablespoons of hot oil in wok or frying pan. After garlic, ginger and scallion have perfumed the oil and start to brown lightly, remove and discard. Add veggies, stir fry to desired doneness. A beautiful side that will compliment any meat, fish or poultry dish. This past week harvested Bright Light Swiss chard, mustard greens, beets, parsley and basil for friends who stopped by the garden gate, no photos. Also harvested a handful of raspberries, no photo (they never made it through the garden gate). Birds and other critters are enjoying the ripe berries, I was lucky to find a handful. Harvested about 6 ounces of sugar snap peas. All went into the Swiss chard stir-fry together with the red and yellow tomatoes. Okra and parsley went into a stew. Arugula, lettuce and mache will go into a salad. Most likely just do a simple stir-fry with the amaranth. 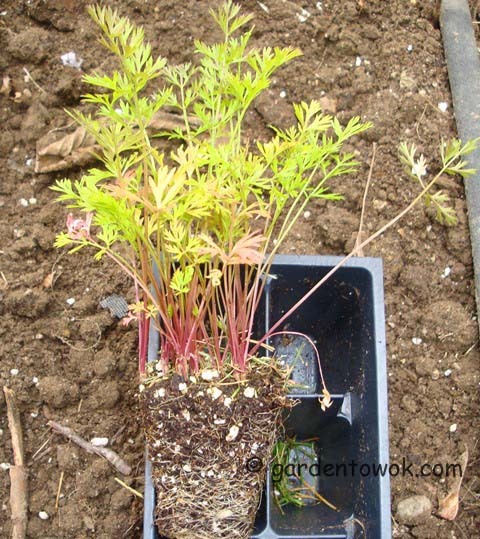 While visiting a nursery in the spring I saw carrot seedlings in cell pack. 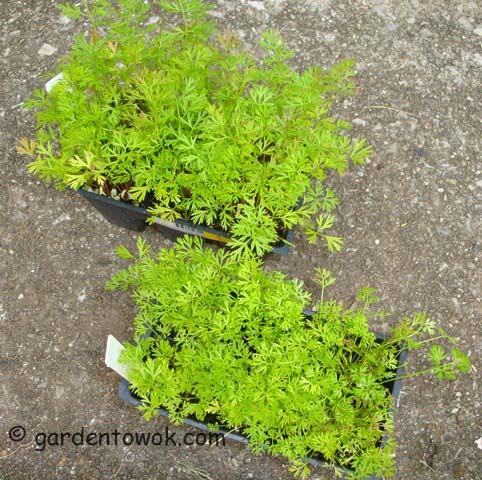 This is the first time I am seeing carrot seedlings for sale. Thinking: That’s a great idea, must give this a try as I have problems with direct sowing. Either poor germination or good germination and thinning becomes a pain in the neck, or critters decide to feast on the seedlings. So instead of direct sowing my fall carrots, decided to experiment and sow in cell pack. The germination was excellent and I did not have to worry about critters. Sow 2 varieties of carrots, cosmic purple and coreless nantes, in cell pack on June 1, 2014 (my sister, Joyce, babysat them while I was on my trip). With the roots so tangled was worried that it would be difficult to separate each seedling but need not worry, the seedlings separated very easily and not as fragile as they look. (Not sure why the photos of the cosmic purple seedlings in the above photo and the next 2 photos below are so yellow, they were taken in the garden where it was sunny. The previous photo with the green seedlings was taken in a shady location). Will the carrots grow long and straight? Find out at a later date. Hoping for success and looking forward to harvesting many delicious carrots. I shall keep you updated on the progress and results. If successful will definitely start my carrots in cell packs in the future, no more direct sowing. Something is wrong with the oven of my BRAND NEW stove, very noisy when turned on especially the convection feature, impossible to stay in the kitchen when oven is on. This is supposed to be Electrolux high-end product. Waiting for service center to come and find the problem and take care of it. Honestly, I didn’t think anything else could possibly go wrong with my kitchen reno. Murphy’s Law at work here! 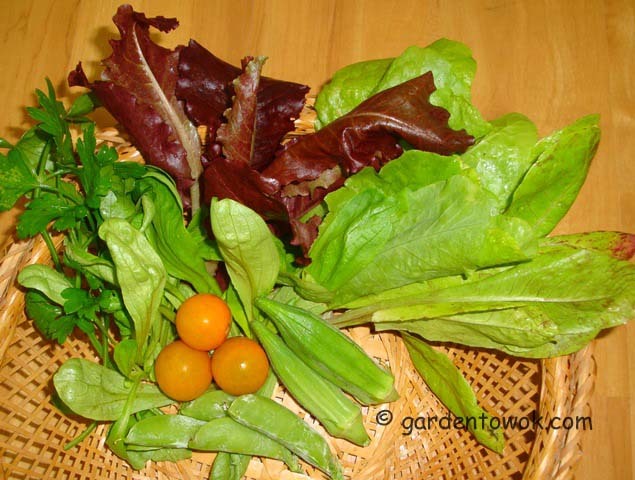 This entry was posted in Gardening, Harvest Monday, kitchen reno, Recipes, Uncategorized, Vegetables and tagged cherry tomatoes, coreless nantes carrot, cosmic purple carrot, Electrolux stove, peppermint Swiss chard, sugar snap peas, Swiss chard. Bookmark the permalink. Everything is always so healthy from your garden Norma. I didn’t even know you got peppermint swiss chard. Your stir fry looks so tasty! Oh no, not something else with the renovation. Insist on a new unit Norma, don’t let them try and fix your oven – it is brand new! I had problems with a new fridge and new freezer – they just don’t make things to last now days – so wrong! Have a super day and here’s hoping the oven was the last of the renovation problems. Thanks, this is the first year I am being introduced to Peppermint Swiss chard and really love it. The company will not give me a new unit until they try to fix a few times and cannot solve the problem. A super day to you too. Bah…a NEW stove that doesn’t work…an expensive one at that!!! What is the world coming to??? Your vegetables look great. My farmer didn’t put in Swiss chard this year. I will miss the beautiful colors (so glad you gave us a picture). We are really enjoying the early cabbage, cauliflower and broccoli. Isn’t growing FUN!!! They do not make appliances the way they used to, so say many people. I decided to take out extended warranty for both my stove and refrigerator. Sound like you are having a wonderful harvest. That strifry looks so pretty. I hope those carrots work out for you. I can’t believe they will as rocks will make a carrot fork or stunt. The bottom of a cell pack must be worse. But I’m hoping you get long carrots. Thanks. Yes, I hope the transplanted carrots work out for me. Will post updates. Your harvest is beautiful Norma. How horrible that your new oven isn’t working well, hope they can find the problem quickly. Thanks. Waiting for the repairman to call and let me know when he can come and take care of the problem. Oh I am very curious to see how the carrot experiment goes. I get miserable results with direct sowing, but the boys adore carrots. I like the sound of that oil, too – I’ll definitely give it a try! I will be posting updates of my carrot experiment. Norma, I have a very expensive gas high-end Electrolux oven and love it. It does everything but dance. Has dehydrating and a bread proofing settings. I am sure it can be fixed, or else insist on replacement. It seems none of the appliances are built as they used to be. I took out an extended warranty because I am concerned about the oven computer. Glad to know you are happy with your Electrolux gas oven. I too took out an extended warranty for my stove and refrigerator. Is peppermint Swiss chard available where you are? I just love how beautiful the stalks look. How frustrating! Is the rest of the kitchen done? Did you get the cabinet issues resolved? Well I do hope it all gets ironed out so you can enjoy your new space with a smile on your face. Replacement cabinets arrived last Wednesday but they were of the wrong shade of white, can you believe this????? The bright side is, the color discrepancy was discovered before they were installed. I’m so sorry to hear about your new stove not working properly…another setback to getting your kitchen finished is terrible. 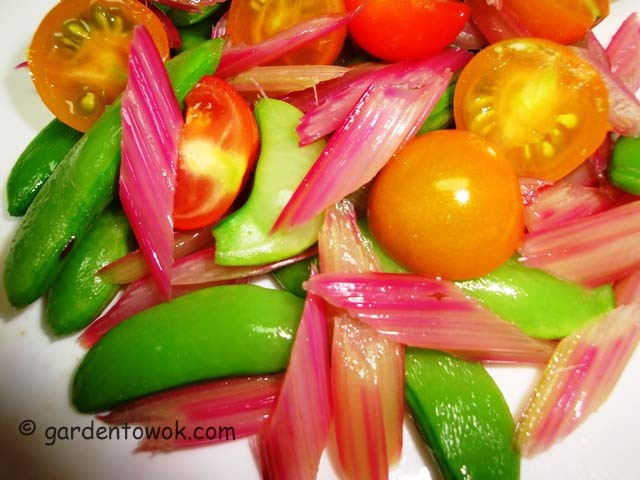 The nice thing is that your garden is giving you lots of healthy veggies to stir fry. I think I would go crazy if I did not have my garden as a sanctuary. That carrot experiment is fascinating (I LOVE garden experiments!) Last year I had big issues with germination and slugs/earwigs eating the carrot seedlings, although this year was much better. My issue now is more to do with timing – I’m worried that by the time I pull my current crop, there won’t be enough time for the fall carrots to mature. If I could get them started sooner, that would be a big plus! It is so true that appliances are not built to last like they used to be. I’ve even heard of very expensive appliances becoming useless when one little inexpensive part breaks because they “no longer manufacture” it. Quite infuriating. I had timing issues with my fall carrots and other fall crops. Will be posting more about my other fall seedlings that I started in June. Sure hope I do not have any issues with my fridge and dishwasher. Have not tried my dishwasher yet as the temporary counter prevents me from opening the door. Your even grow okra!!! I have lots to learn about gardening from you, Norma. Yep, I grow okra. Send me a note anytime if I can help with any gardening info. 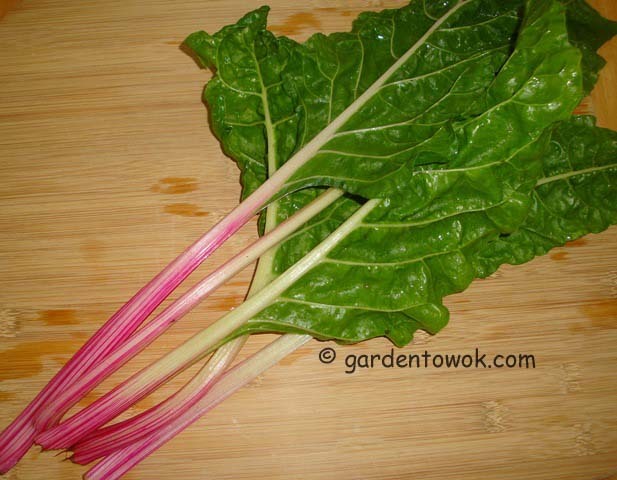 Hi Norma, I don’t know how many times I have thrown out the chard stalks, love this recipe. So sorry about your stove, I would tell them to replace it, not fix it unless it’s something really simple. I wish I would have done that with my kitchen remodel, now about once a year I have to call someone out for the same problem and it’s a 90.00 dollar charge each time. Glad to learn you will be using your chard stalks from now on. I was told by Electrolux that they will replace the stove only if problem is not solved after a few fixes. I don’t think I have ever heard a good kitchen reno story. They all seem to be very stressful. I had to smile about the macadamia nuts though. I literally just saw a bag of them in my basement not 10 minutes ago and thought hmmm…I’ve had those for a while and I have nothing to do with them. Stir fry is a great idea! If we leaved closer, I would walk you over the bag! This is my 2nd kitchen makeover, the first one went smoothly without any problems, so I was totally unprepared for the issues with the current reno Coming to an end soon, I hope. Thanks for the macadamia nuts offer. The Peppermint chard is pretty. I may try it next year, not impressed with Magenta Sunset. Too bad about the oven, but you should keep after them o fix it or replace. I am definitely planting Peppermint chard again next year. I think it would be pretty in a flower bed but my deer would demolish it in no time. I am so sad that I missed the opportunity to meet you when you were in NYC. Hopefully the problem with my oven is a minor one. That chard is so lovely! I think you deserve a break on your remodeling. It shouldn’t be that problematic! We have done many remodeling over the years, this is the first time I am encountering so many problems with a reno. The way you did your carrots is pretty much how we do our onions, but they’re a bit more tangly to pull apart! Thankfully I gotten it down to a wiggle science now! Loving this happy harvest monday post! That’s how I do my leeks and onions also. Hope this carrots experiment turns out to be a good idea. Thanks for the compliment. I am sure a break will come in the not too distant future. Poor you and that kitchen! When it’s done you are going to be so happy! That peppermind Swiss chard (or silverbeet as it’s called here) looks amazing. I love those stripes. Oh yeah, I will be the happiest person when my kitchen reno is completed and my house back to order. Oh Norma! I am so sorry that your kitchen renovation is so stressful. I hope you find out why your oven is loud soon and are able to return to normal. I am sure this nightmare will come to an end. Will be posting updates about my carrot experiment, hoping for success. Hope it is fixed soon! Thanks, yes, fresh and tasty. I was told it is wise to purchase extended warranty for appliances as they do not make them the way they used to, very sad indeed. Peppermint Swiss chard is so pretty how can any gardener resist planting it. I am sure it is going to gain popularity. Hope you find some at your farmers market. When my kitchen is fully installed and working properly, you will hear my shout all the way in Chicago. Oh gosh, I know how you feel. My stove didn’t work when it was new and it turned out that it was wired improperly. They fixed the wiring and then it was ok. I hope your fix is an easy one. I’m growing peppermint chard for the first time this year also and it’s my favorite of the 4 varieties that I’m growing. It’s so pretty and very tasty too. Hope my stove’s problem turns out to be as simple as yours and is trouble free after the fix. Definitely growing peppermint chard again next year and future years. For us, Rainbow Swiss chard is a mixture of different color chards Waiting for repairman to come and let me know what’s wrong with my oven. Hopefully soon. The peppermint chard is so pretty, how’s the taste? I’ve never transplant carrots before, curious to see how yours turn out, please keep us updated. The peppermint chard tastes just like any other chard, I could not detect any difference. I hope my carrot experiment is successful, I will be posting updates. “Like” all of your garden produce and that stir fry with the peppermint chard looks so beautiful and delicious. But I don’t like hearing about your oven. Sigh. Do hope that they get that fixed/replaced and everything else up to snuff for you very, very soon! Thanks, it is a pretty chard. I am told by many that appliances are not made like in the olden days, to last, so I bought extended warranty for the stove and fridge. Hoping to get oven fixed next week.. Thanks. I will be positive. wow, good luck with your carrot!!! Yes, could be not enough sun, thank your grandma for me. 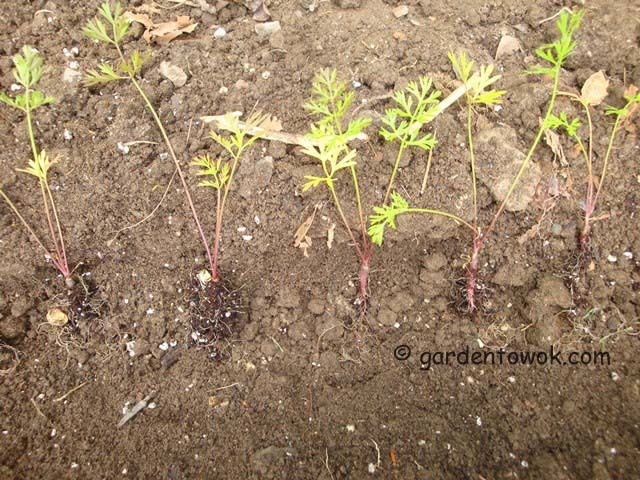 Hope my transplanted carrots grow straight, I may just pull one in a couple of weeks to see how it is doing underground. Beautiful harvest Norma and love that quick little stir fry. Wow your stove too? Deep breaths maybe it is something simple that can be fixed and if not be sure to make them take the lemon out of your kitchen and replace. Hmm. Does straight carrots really have something to do with the way you plant them? Hoping that your carrots are long and beautiful. Yes, I need to make sure the roots are straight and there are no stones in their path before covering with soil. Also if the soil is hard they will grow crooked so soil must be tilled before planting. Good to know…Back in Michigan we used to have clay and rocky soil that explains a lot… about my dads short stubby odd shaped carrots. Cute.. but odd looking carrots. Have a super day! Your Dad could try growing a short stubby variety. A super day to you too.